All solar projects will be built specifically to serve the program. Pacific Gas & Electric has launched a community solar program that allows customers to get half or all of their electricity from the sun. The program is tailored to customers that can’t or don't want to put solar on their roof -- renters in high-rise buildings, for instance. According to the National Renewable Energy Laboratory, approximately half of U.S. households and businesses are unable to install rooftop solar because of ownership, space or shading limitations. A recent survey found that more than 50 percent of PG&E customers say they want to go solar. The community solar program allows customers to buy solar power from entirely new, locally sourced projects, which is a priority for many Californians. To participate in the program, customers have to pay a premium. For residences, it’s an additional 3.58 cents per kilowatt-hour; for small businesses, it’s 2.8 cents per kilowatt-hour; and for large businesses, it’s 2.85 cents per kilowatt-hour. “This makes sure that other ratepayers or other customers who choose not to be part of the program aren’t paying for the program,” said Ari Vanrenen, PG&E spokesperson, in an interview. For typical homeowners who use 500 kilowatt-hours of electricity per month, getting 100 percent of their electricity from solar through the PG&E program would cost an extra $18 per month. PG&E expects there to be strong demand. 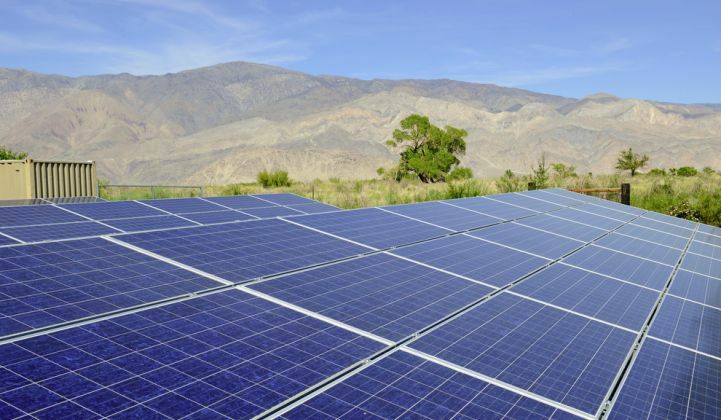 The California utility has already connected more than 215,000 solar customers to the grid, and anticipates that the Solar Choice program will bring solar to 40,000 additional homes and businesses across the company’s service area. Customers in California do have other options, though, even if they can't put solar on their own roof. Increasingly, they’re turning to community choice aggregation (CCA) programs for cleaner, local, more affordable energy. At least two communities in PG&E territory -- Marin County and Sonoma County -- have already set up CCA programs. Participants in CCA programs contract for their own generation and pay a fee to use the utility’s wires and poles. CCAs take time, upfront capital and a lot of commitment to establish, but so far this option has proven cheaper than the status quo. Geof Syphers, CEO of Sonoma Clean Power, said he was happy to see a solar option from PG&E, but noted that CCA customers in his territory have the ability to support an even greener grid. According to Vanrenen, the Solar Choice offering isn’t about competing with CCAs. “With Solar Choice, PG&E is really responding to the desire of many of our customers to have more renewable energy options,” she said. California lawmakers recognized this in passing a community solar bill in 2013, with the aim of delivering 600 megawatts of solar energy customers across the state. Regulators specified that utilities are not allowed to build and own the projects. Other states, including Colorado and Minnesota, have also passed community solar legislation. PG&E put out a request for proposals last year, and has already contracted for an initial eight projects to serve the program totaling 50 megawatts. Selected installers include Western Grid Development, Bakersfield PV I and Mirasol Development. These new projects are under construction and expected to be complete by 2018. In the meantime, PG&E has set aside an interim pool of solar resources to serve Solar Choice customers. None of these projects help PG&E meet its California renewable portfolio requirements, which the state recently increased to 50 percent. The Solar Choice program is capped at 272 megawatts. California’s other two investor-owned utilities, Southern California Edison and San Diego Gas & Electric, are also expected to launch community solar programs this year.